After three-game cancellations due to inclement weather, the St. Paul Indians were back in action, Feb. 9 as they faced the Olpe Eagles. 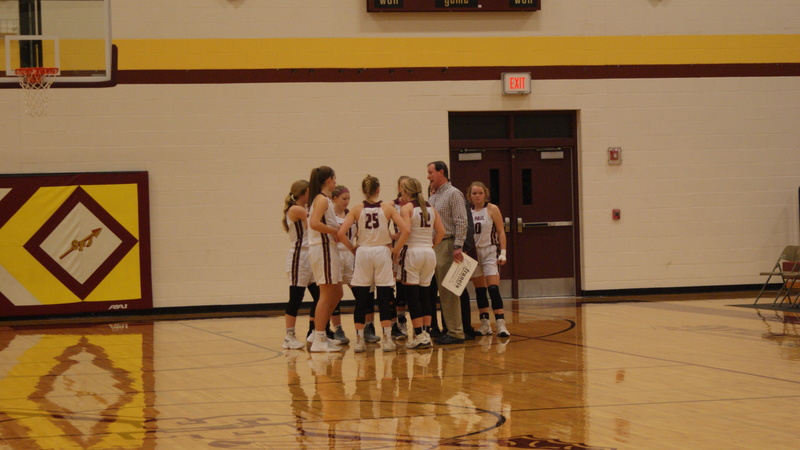 Following the Lady Indians previous game, they were defeated 46-35 as the Raiders aggressive defensive mentality became too much for St. Paul. Olpe (15-0) has been regarded as one of the best girls’ teams in the state as they have yet to lose a game coming into their matchup with St. Paul (11-3). Freshman Claire Bradshaw provided a much-needed spark to the Lady Indians offense in the first half scoring 9 of St. Paul’s 16 points. The offense came at a premium for the Lady Indians as the Eagles stifling defense became troublesome for Coach Doug Tuck’s Indians. Olpe’s Davis became the biggest problem for St. Paul as she scored double-digits in the first half (10). St. Paul trailed Olpe 36-16 at the half. From there, the Eagles continued to shoot lights out from the field as their lead became too much for the Lady Indians to make a comeback effort. Olpe’s red-hot streak (16-0) continues as they went on to defeat St. Paul (11-4) 63-31. Freshman Bradshaw led the team in scoring on the night finishing the game with 15 points. Junior Katie Coomes was the second leading scorer as she was held to 6 points. For the boys, they come off a tough 60-38 loss to the Frontenac Raiders, Jan. 31. Feb. 9, the Indians (6-8) faced-off against the Olpe Eagles (10-5) for their rescheduled non-conference matchup. The junior tandem of Adam Albertini and Kaleb Lemmons made a significant impact in the first half combining for 18 of the Indians 27 points. Olpe stayed close behind but St. Paul led 27-18 at the half. Olpe was not backing down quite yet as they would make a run back into the game contesting the Indians till the final buzzer. The Eagles held St. Paul to only 7 points in the fourth quarter. With strong, clutch play from the Indians (7-8), they were able to hang on 46-45 defeating Olpe (10-6) in a nail-biter. Junior Lemmons had a strong night offensively for the Indians finishing with 17 points for the Indians. Albertini finished the game with a strong performance as well scoring 14 points on the night. The Indians will travel to Oswego Tuesday, Feb. 12, in a TRL-conference matchup.